Adam Lambert Gets “Into the Groove” – A Thanksgiving Treat for All! You are here: Home / Adam in the Media / Adam Lambert Gets “Into the Groove” – A Thanksgiving Treat for All! As many were rising from their tryptophannic nap last night (or pulling into the garage coming home from family visits) we were delighted to turn on the TV last night, just in time for Glee. Adam Lambert was back on Glee’s screen after a two-episode absence, giving us pure entertainment. The plot had Kurt’s band, Pamela Lansbury, making their debut performance and they covered Madonna’s Into the Groove. I find it kind of ironic that Adam left his label because they were only supporting him if he did an 80s cover album. Since then, we’ve seen him lead singing for Queen at iHeart Radio Music Festival (70s and 80s) and now his Glee role of Elliott/Starchild has him doing Madonna covers, which started in the 80s. At least someone in the cast brought up objections to only doing Madonna covers, so maybe their band won’t be stuck in time. adam-lambert.org would like to send excitement out to everyone in Miami as they get ready for their post-Thanksgiving treat of seeing Adam in concert on Saturday at the Fontainebleu. Please comment here and let us know how it was! If you want to finish out the year in style, Adam is also performing Sunday, December 29th at the Hard Rock Hotel in Biloxi, Mississippi and New Year’s Eve at the Winstar Casino in Thackerville, Oklahoma. I’m always glad to see Adam anywhere, anyplace anytime. 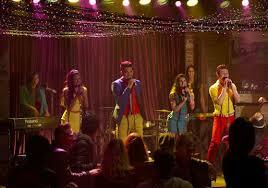 I am sorry to say this but was totally disappointed in ‘Glee’ last night. Not Adam! Oh no, wherever you put Adam or whatever he sings its always beyond belief. But, let’s admit, there just isn’t enough of Adam and this show needs more of him! I will continue to watch ‘Glee’ as long as Adam is on, but after that just won’t watch. The only reason I even started watching was Adam Lambert. He’s just the greatest! i totally agree! I can never get enough of Adam. Jackie, I also was very disappointed to see so little of Adam on “Glee’last night too. I mean Adam is too good to just be shown anywhere for a few lines. You are right ,he sings just beautiful. I just love Adam. I have from the first day I set eyes on him. I do not care to watch Glee at all unless they give Adam a major part. I miss Cory so much and it hurt when he died. But Adam can come in to this TV show and make it great. But they have to really make his part a regular for me to keep watching it. The part about the puppets or what ever they were was boring and dumb! More Adam Lambert peope at Glee! Love you Adam! Let us see more of you! Ditto again!!!! I actually never liked the show and also only watched it just to see Adam…. Triple Ditto!! Was looking forward to Adam on Glee….had told family and friends that had joined us for the holiday that we WERE watching; wanted them to appreciate Adam as much as I do. What a let down and disappointment. Yes, he sang with the band, but no solo, camera was hardly on him and the whole puppet sequence was asinine!! Missed opportunity. I’ve always hated Glee! I do, however, like Sue Sylvester I must say…but I started watching for ADAM. I am SO glad they are letting us know in advance which episodes ADAM is on…if I had to watch every week I don’t know if I could do it 🙁 I was as disappointed as the rest of you. ADAM was barely there. Why would they take such a popular mega talent and do so little with him? For me ADAM just doesn’t fit…maybe because he is not obnoxious…he’s to likeable and all eyes go right to him. I’m right there with you. I did watch for a couple of seasons, but the best part was always when Sue came on. It’s great seeing Adam on TV though. I hope he reaches so many more people!